(Francisco Kjolseth | The Salt Lake Tribune) Rev. 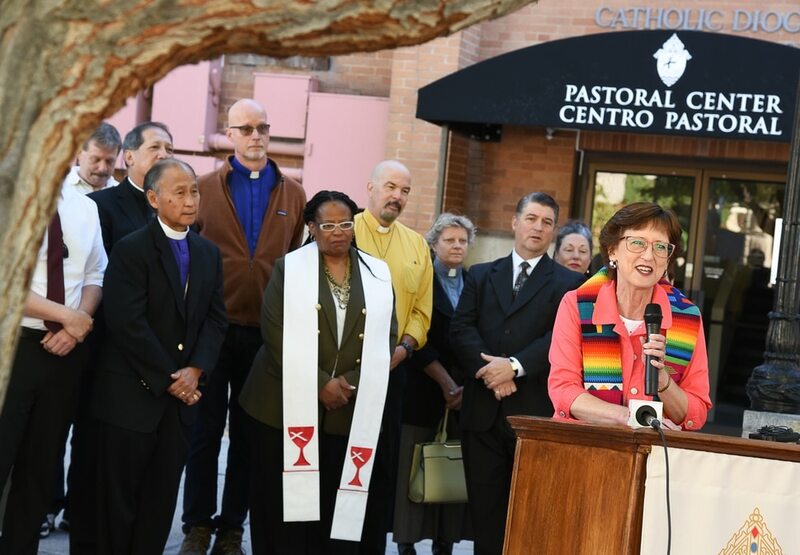 Kim James of First United Methodist Church, Marriott-Slaterville, joins other Utah faith leaders at the Cathedral of the Madeleine in Salt Lake City on Wed. Oct. 3, 2018, to make a joint statement in support of Prop 3, which would expand Medicaid in Utah. (Francisco Kjolseth | The Salt Lake Tribune) Rev. 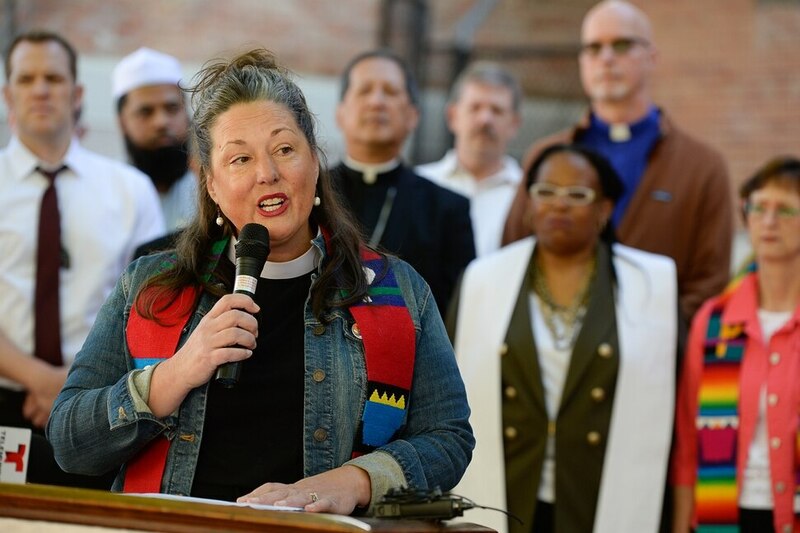 Monica Hall with Trinity Presbyterian Church in Ogden joins other Utah faith in Salt Lake City on Wed. Oct. 3, 2018, to make a joint statement in support of Prop 3, which would expand Medicaid in Utah. This vote is about living out a commandment. Join us in caring for the poor. (Francisco Kjolseth | The Salt Lake Tribune) Utah faith leaders gather at the Cathedral of the Madeleine in Salt Lake City on Wed. Oct. 3, 2018, to make a joint statement in support of Prop 3, which would expand Medicaid in Utah. (Francisco Kjolseth | The Salt Lake Tribune) Imam Shuaib Din, Utah Islamic Center, joins other Utah faith leaders in Salt Lake City on Wed. Oct. 3, 2018, to make a joint statement in support of Prop 3, which would expand Medicaid in Utah. It is a win, win for this world and in the afterlife. (Francisco Kjolseth | The Salt Lake Tribune) Catholic Bishop Oscar A. Solis joins other Utah faith leaders as they gather at the Cathedral of the Madeleine in Salt Lake City on Wed. Oct. 3, 2018, to make a joint statement in support of Prop 3, which would expand Medicaid in Utah. 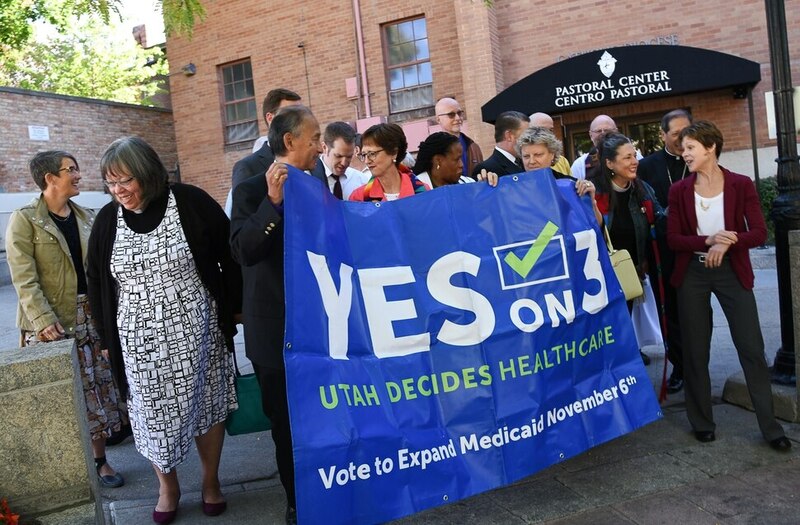 Just under 20 men and women of the cloth, bedecked in multicolored religious symbols and representing a spectrum of Utah faiths, stood side by side Wednesday to reaffirm their collective support for Proposition 3, which would expand Medicaid coverage to 150,000 uninsured individuals in the Beehive State. Several clergy mentioned that Jesus was a healer and taught his followers to care for one another. That is what Prop 3 will do, said Bushdiecker, who relied on some Medicaid assistance as a single mother working two jobs in another state. With this ballot measure, Utahns have a chance, she said, to do God’s work by extending health care to some of the most vulnerable in the state. The Rev. Monica Hall, from Trinity Presbyterian Church in Ogden, and other clergy in attendance have advocated for Medicaid extension since 2014. Though many more individuals and families would be helped if the measure passes, Imam Shuaib Din of the Utah Islamic Center in Sandy said it’s not about numbers. One notable absence in the group was an official representative of The Church of Jesus Christ of Latter-day Saints. Utah’s predominant faith has been fighting Proposition 2, which would legalize medical marijuana in the state. Though not speaking for his church, Eric Biggart, chairman of the LDS Democrats Caucus, drew on Mormon scriptures and faith to explain his group’s support of Proposition 3.